We are delighted that our consistently excellent Sixth Form A Level results have been recognised yet again. "This certificate is testament not just to the hard work and stamina of our students, but also the skill and dedication of staff and tireless support from parents. It is because of our consistently excellent Sixth Form results that such high proportions of our students go on to study at 'Top Third' and Russell Group universities." - Sue Maguire, Headteacher. 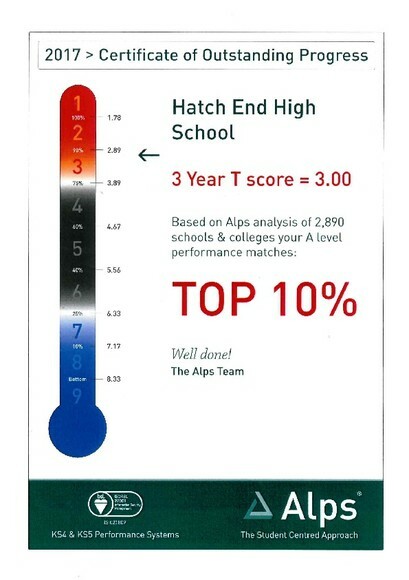 As the above certificate demonstrates, Hatch End High Sixth Form offers the opportunity to develop a wide range of academic and personal skills within a supportive, structured environment. Our entry criteria are highly inclusive and every year we have significantly more applicants than we have places for. All entrants to our Sixth Form are expected to work hard, commit to our educational expectations and play a full and active role in school life. Most students choose four ‘AS’ Level subjects in Year 12 and will then concentrate on three ‘A2’ level subjects in Year 13, however we also offer BTEC Nationals (A-level equivalent) in Business Studies, ICT and Performing Arts. We prepare the overwhelming majority of our Year 13 students to enter Higher Education, but we also provide extensive support to those students who choose to progress on to apprenticeships, college courses or work-based training. In addition to their academic studies, students pursue a PCSHE programme that includes career planning, study and work skills development, active citizenship and personal finance. To enable our students to maximise their chances of success, we have a strong and comprehensive assembly tutorial and pastoral support programme that allows students access to their tutors for over two hours per fortnight, enabling them to benefit from supplementary guidance to that given by subject staff and the Sixth Form Management Team. Sixth Form life at Hatch End High School is one of involvement. It is demanding as well as rewarding for students who approach their post-16 studies with the desired attitude and energy. Students’ lives are also enriched by the variety of extra-curricular activities, additional responsibilities and work experiences.